Search Engine Optimization (SEO) is the process of optimizing a website to rank high on search engines for a relevant set of keywords and/or keyword phrases. SEO involves on-page and off-page optimization. It is important to understand that these days, SEO is not just the process of keyword stuffing your web pages. Doing so will not help your search engine rankings and it may even lead to your website being penalized or banned. Columbus Website Design provides both on-page and off-page optimization for your website. Today, top placement on search engines is critical to the success of almost any website. If your website is not on the first page of the Search Engine Results Pages (SERPs) for your targeted keywords, your site will go unseen by potential new customers and existing customers. Most of our clients request natural (AKA organic) search engine rankings of their website to help curb the cost of advertising services such as Google Adwords which is a Pay Per Click (PPC) form of advertising. Ranking your website naturally allows you to benefit from free, targeted, ready-to-buy, traffic from the search engines. Our unique Search Engine Optimization process will help your website rank highly and prominently for the targeted keyword phrases of your choice. We customize your website design to be Search Engine Optimized using proper, white hat, SEO methods and techniques. Title elements, alt tags, link title tags, link anchors and meta data tags are all examples of on-page optimization we use. robots.txt coding, keywords suggestions, description research and suggestions (sometimes based on your website’s competition) and local search marketing are additional examples of what we do going beyond basic on-page and off-page search engine optimization. When your website goes live, it is not guaranteed to be included or displayed in Google, Yahoo or Bing search results. It is up to you, the website owner, to make search engines aware that your website exists and to maintain your website’s content to reach top placement. 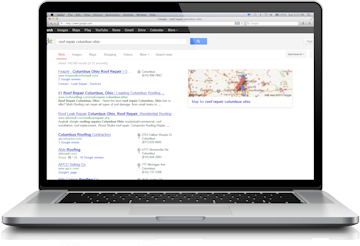 Columbus Website Design’s complete Search Engine Optimization services do just that for you. We will notify the top search engines that your new website is live to the public and ready to be indexed. The search engines will dispatch their crawler to index the content of your website. This is how search engines have functioned from the very beginning. The search engine crawler (AKA spider) will index the content of your website to determine the most appropriate (relevant) keywords and keyword phrases that your website should rank for when users are searching for it. It will take into account over 200 ranking factors in as little as a few milliseconds visiting your website. How long until your website is ranked? The amount of time until a new website can be ranked on Google can be anywhere from a few weeks to a few months. In our experience, we have noticed our client’s websites being ranked on Google in as little as a week and as long as about six months. However, this does not mean that your website will jump on to the first page over night. If your website is brand new, meaning Google has never indexed it before, it will likely start out on the 10th, 20th or 30th page of results and will then need to grow from there. This is how Google ranks new websites to prevent spam and scam sites from populating their results. It is in Google’s best interest to deliver the most relevant and reliable results to its visitors. There are a number of ways that you, as a new website owner, can help it grow and we will be glad to develop a custom plan of action for your SEO project. Meta Tags used to be the go-to solution for optimizing a website to rank high on Search Engine Results Pages (SERPs). However, those days are long gone and you can no longer optimize any website by implementing just meta tags. Your website needs to provide great user-experience to your visitors by offering them educational and useful content not designed or developed for search engines. Creating a website that is informational and educational in nature will ultimately help you gain rankings in SERPs. Local SEO is the process of optimizing your website’s pages to rank high for keywords that include a geographic reference. As an example, if you own a plumbing company in Columbus, Ohio, we would help get the website ranked on Google when someone searches for “plumbers in columbus” or “columbus ohio plumbers” or “pipe fitters in Columbus, Ohio”. Each of these results will display differently in search engines and it would be beneficial for your business to rank on the first page for each of these terms. This will also enable you to compete with other local plumbers in the Columbus, Ohio area. Local SEO is typically only beneficial for companies that only offer services locally. Rich snippets are increasingly becoming more popular on Google’s results pages. These small amounts of data are displayed on Google’s search results as a few lines of text that appear under a search result. They were created to increase the user’s experience and give them an insider’s look into what the page is actually about and if the page is relevant to the keywords they are searching. Rich snippets can appear in the form of user reviews, the name of an author of a blog post, products with pricing information, names of businesses, the address of a business, phone numbers, recipes, events, lists of music and more. Let us help you compete on search engine results pages. We can create a custom SEO audit on your existing website or create a custom plan of action for your new website. Give us a call or request a free quote online today to get started. We will improve your website’s rankings on Google, Yahoo and Bing search engines in as little as two weeks. However, it is impossible to predict the results of Search Engine Optimization and you should never trust an SEO firm that guarantees their results. If they are guaranteeing their results, they could be selling you Pay-Per-Click (also known as PPC) services which is not the same as natural or organic SEO services that Columbus Website Design provides. We have ranked thousands of web pages for highly competitive keywords and keywords phrases in local and national markets on Google, Yahoo and Bing search engines. Typical turn around times for most new projects can take anywhere from a few weeks to a few months. Unfortunately, we can not directly control the ranking your website receives. However, we can only help to influence your rankings with time honored, white hat, experience and expertise. We look forward to helping your website gain a competitive advantage on search engine results pages. Contact us today for a free quote. Stop by our testimonials page for a list of satisfied customers who hired us to rank their website(s) on the first page locally and nationally on Google, Yahoo and Bing search engines.